Control when the YouTube (embedded in flipping page on MAC) play or stop? When enter any flipping page which is embedded with YouTube video, you would feel interested in how to control when the video play or stop. Maybe when you flip the page, it plays, or when you leave the page, even when you click the button of play. 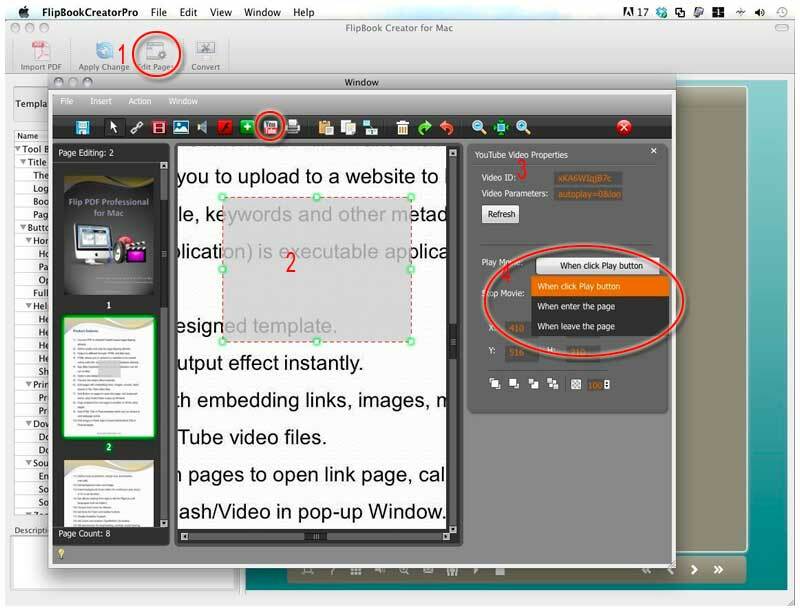 FlipBook Creator Professional for MAC enables you to embed YouTube online video and control when it play or stop. Step1: Launch FlipBook Creator Professional for MAC, import a PDF file and then click the top icon of Édit Pages to enter into the flipping page editing interface. Step2: Click Insert --> Insert YouTube, and then circle an area on the selected page to hold the YouTube video, enter the YouTube ID in the right edit window. Step3: In the below selecting options area, choose one from When click play button, When enter the page and When leave the page. So that you can control when the YouTube video play or stop viewing the flipping book.